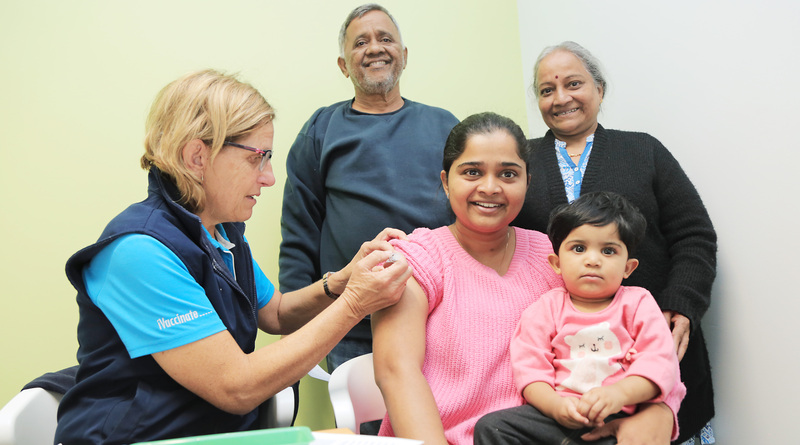 Left to right: Registered nurse Lisa Irvine and family Ram Raut, Rina Raut (getting vaccinated), Myrah Manjreicar (toddler) and Jyotsna Raut. Free flu jabs have been provided to more than 100 people at Mount Druitt’s Dawson Mall and the Mount Druitt Health Hub, as part of Western Sydney Local Health District’s (WSLHD) campaign to encourage the community to get vaccinated this winter. The flu vaccine has been provided free for a limited time in communities across the state as part of NSW Health’s $1.75 million immunisation campaign following one of the worst flu seasons on record last year, which caused over 650 flu-related deaths. “Vaccination is your best protection against the flu, so we encourage you and your loved ones to get vaccinated against this deadly infection this winter,” WSLHD population health deputy director Christine Newman said. Left to right: Registered nurse Retha Havenga, Rebecca Kilroy and son Sam Kilroy. o Stay home when sick. Western Sydney Local Health District will be implementing its winter plans for local hospitals, which include procedures for allocating additional resources during periods of high demand, providing free flu vaccinations for frontline health staff and promoting good hygiene practices that help fight the spread of flu. “The World Health Organization advises this year’s flu vaccine will be a better match to the four circulating strains and offer higher protection than last year. We urge everyone to get the flu jab to build our immunity in the community and beat the flu bug this winter – it could save your life,” Christine said. Want to know how good electronic medical records really are?